It's early evening as Joanna Siwek, a 21-year-old student at the University of Texas, makes her way across the cobblestone streets of the Old Town square in Krakow, Poland. She and her companions, all participants in a study-abroad program at Jagiellonski University, are excited by their night's mission — to find an underground cellar pub and take their first sip of a freshly brewed Polish beer. "This city is a hidden treasure," Siwek says later. Until recently, Krakow's secret treasures have been well kept. But this historic Polish city is quickly becoming one of Eastern Europe's trendiest hotspots for young people from around the globe. "Krakow is the most popular destination right now for students," says Teresa Frankiewicz, owner of Doma Travel, in Linden, New Jersey, an agency that specializes in trips to Poland. That's partly because of the growth in the number of colleges and study-abroad programs based there. 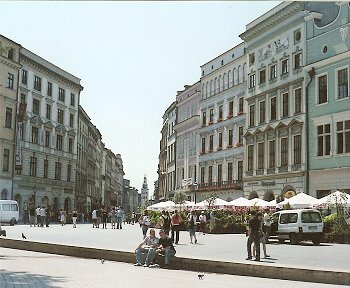 An estimated 27,000 students live in Krakow, according to The Evening Standard newspaper. And when they're not studying, they're finding ample opportunity for entertainment: According to Cracow-life.com, a tourism Web site, the Old Town district has more bars per square meter than anywhere else in the world. "Krakow is the new Prague," says Kamila Czoch, a 23-year-old graduate student at New York University who has visited Krakow numerous times with her family. Czoch, whose parents emigrated from Poland to the United States when she was nine, thinks many of the young visitors include people like herself: American children of Polish immigrants who are eager to embrace their ancestral roots. Krakow is Poland's second largest city, and one of the few left standing after World War II. The charming Old Town district is filled with gothic and baroque cathedrals, some of them dating as far back as the 8th century. Rynek Glowny, the largest medieval square in Europe, and the Wawel Castle, a medieval hilltop castle, are among the most popular tourist destinations in the area. But, for many young visitors, the big draw is Kazimierz, which was the city's Jewish neighborhood before the Nazi occupation. Located just a 10-minute walk from Wawel Castle, the area is now home to many of Krakow's trendiest bars, restaurants, cafes, and clubs. Budget-conscious students can easily find safe and comfortable accommodations. At Hostel Momotown, located in the heart of Kazimierz, students can spend the night for just $14 in a shared room with ten beds or $18 in a room with four beds. Another good budget option is Stranger Hotel, named as one of the hippest hostels by Lonely Planet Bluelist in 2006. There, a bed is about $15 a night, and the price also includes free use of the Internet, Xbox, DVDs, and a grand TV. Options for cheap eats are abundant, too. Chlopskie Jadlo, which translates to "Peasant's Kitchen," looks at first glance like a hole in the wall, but is a favorite destination among both locals and visitors seeking a unique Polish experience. The restaurant serves hearty meals such as potato pancakes and Smalec, a lard spread served with bread. Full dinners run from $10 to $20. Another popular cafe is Jama Michalika, a historic gathering of spot for young artists, where a full meal, including traditional fare such as beetroot soup and pierogis, costs about $9. Young travelers to Krakow rave about the city's extensive selection of beers, both local and foreign. Some local favorites include Tyskie, Warka, and Lech, all available at almost any cafe, bar, or club for as little as $1 a mug. For true beer lovers, there's CK Browar, The Royal Emperor's Brewery, which produces five different Polish ales — and doubles as a gathering spot for students. Its entrance is typical of most Krakow cellar pubs: Small steps wind down into a cozy room dimly lit by Tiffany lamps and by the copper shine of the brewing vats in the rear. Krakow's nightlife is especially lively. The vast array of clubs in the Old Town square feature everything from R&B to techno to heavy metal. Visitors can enjoy a variety of entertainment in a single club, since many have more than one dance chamber, each featuring a different kind of music. One such club is Faust, where an underground tunnel leads from one room to the next. Each room has a distinct style, ranging from a quiet café to a crowded dance floor filled with a good-looking and well-dressed cosmopolitan crowd. Another great club is Fusion, which has a more spacious dance floor and is air-conditioned. Young people seem to appreciate the fact that Krakow still feels relatively undiscovered. Students say it has everything visitors can find in other young, hip European cities — minus the crowds and tourist overload. Above all, they describe Krakow as "exciting" and "fun." "The people are very enthusiastic," Siwek says. "Everyone is out to have a good time."